Are you interested in trading the inverse head and shoulders chart pattern? The inverse head and shoulders chart pattern can be very profitable if you use the right trading strategy. Many price action traders use this profitable chart pattern and its opposite, the head and shoulders chart pattern. There are many different strategies for trading this chart pattern but I believe the strategy that I use is the most profitable way to trade the inverse head and shoulders. In this addition to me free price action course, I’m going to show you how to identify the inverse head and shoulders. I’m also going to show you two traditional, but profitable, ways to trade this pattern as well as my favorite strategy. 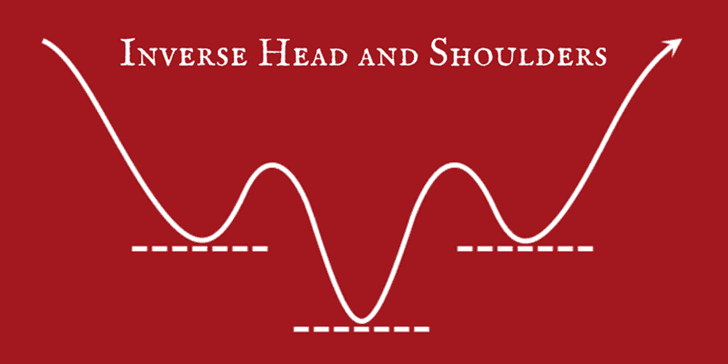 What is an Inverse Head and Shoulders Chart Pattern? An inverse head and shoulders chart pattern is a strong bullish reversal signal. It occurs when a downtrend fails to produce another lower low and instead produces a higher low. The idea is that the failure of the downtrend to produce another lower low is a sign that momentum may be leaving the trend. The neckline is typically drawn off of the real bodies of the candlesticks of the high after the left shoulder and before the right shoulder (see the image above). In the image above, the neckline is perfectly horizontal. The neckline can be horizontal, ascending, or descending. 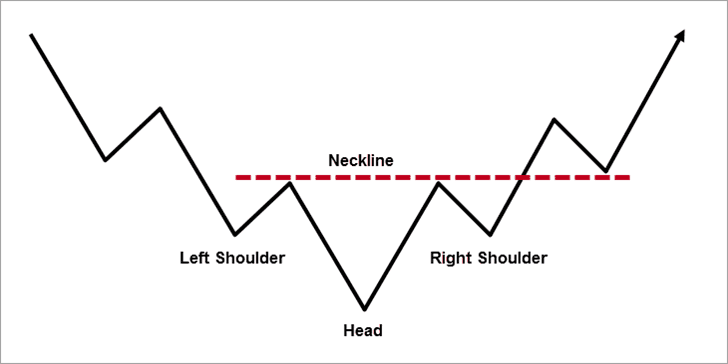 Traditionally, if the neckline is ascending the inverse head and shoulders chart pattern is considered to be more bullish and if the neckline is descending the pattern is considered to be less bullish. Note: Although an ascending neckline is typically considered to be more bullish, I prefer to trade these patterns with horizontal or descending necklines. In my experience, patterns with horizontal or descending necklines provide better reward to risk ratios (more on this below). 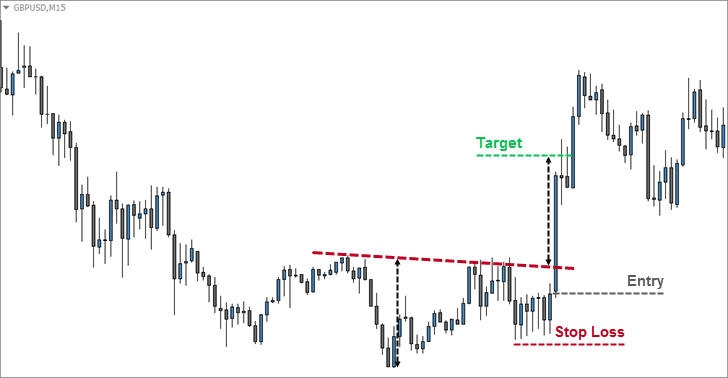 Starting with the standard inverse head and shoulders trading strategy, entry is taken when price breaks the neckline. Some traders prefer to wait for a candlestick to close above the neckline before entering the trade. Note: Waiting for a candlestick to close above the neckline will often lead to missed opportunities or poor reward to risk scenarios. The stop loss is placed below the right shoulder (see the picture above). To get your target, measure from the neckline to the lowest low of the pattern (I prefer to measure to the candle body low). Then take that measurement and duplicate it upward. Note: With a descending neckline (all examples in this article), you should duplicate your measurement up from your entry point. With an ascending neckline, you should duplicate upward from the same point that you took your measurement. In my experience, this is the way that has worked best, and it’s also why I say that patterns with horizontal or descending necklines provide better reward to risk ratios. Ascending necklines use up much of the reward before the entry is even taken. Another traditional inverse head and shoulders chart pattern trading strategy is to wait for price to break above the neckline and then take the entry if and when price pulls back to the neckline. The benefit of this technique is that it’s a more conservative approach (because price is already established above the neckline) that often leads to a good reward to risk ratio, especially with descending necklines (see the image above). However, you’re never guaranteed a pullback. Place the stop loss under the right shoulder. To get your target, simply duplicate the measurement from the neckline to the lowest low as in the previous example. In order to trade my favorite inverse head and shoulders strategy, you need to combine this pattern with another trading signal. I prefer to use price action signals like the hammer (with confirmation and pullback) or bullish engulfing pattern as an entry trigger for this pattern. In this aggressive technique, you must take your entry before the right shoulder is fully formed. In the example below, I used a bullish engulfing pattern as my entry trigger. 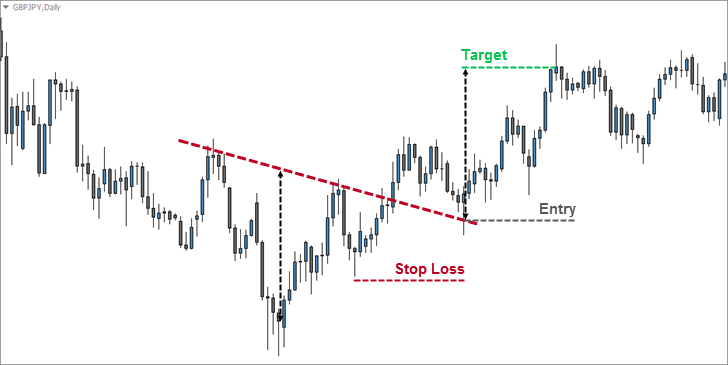 Place your stop loss under the right shoulder of the pattern as in the previous two techniques. To calculate your target, simply duplicate your measurement from the neckline to the lowest low as in the two previous examples. The reason I prefer this aggressive technique is because the reward to risk ratio is usually much better than any other technique that I have used for this pattern. Although the example above is not a great example the reward to risk ratio is still better than the other two examples on this page. Your reward to risk ratio is a huge part of your trading success. Trading the inverse head and shoulders chart pattern will typically provide you with a good reward to risk ratio, especially if you use my aggressive strategy. I’m a big fan of divergence trading. Combining hidden divergence with this chart pattern or even regular divergence between the left shoulder and head of this pattern can help to qualify good trading setups. As a bullish reversal pattern, a true inverse head and shoulders will only occur at the bottom of a trend. Taking these patterns out of context is an easy way to ruin their effectiveness and lose money. Using my aggressive technique, I prefer to move my stop loss to break even before price returns to the neckline when possible. In the example above, this wouldn’t have worked because it’s important to leave the trade with enough “breathing” room. Moving my stop loss to break even in that example would’ve been too restrictive. If you’re a price action trader or like to incorporate price action signals and pattern into your other trading systems, I hope you’ll give the inverse head and shoulders chart pattern a try. Did you already use this pattern? Do you like my inverse head and shoulders strategy or know of another way to trade this pattern? Let me know in the comments below.